Alaska Airline flight attendant Brandy Hollenbeck was working the drinks cart on a Seattle-to-Juneau flight when the pilot's voice came over cockpit public address system. He described meeting the girl of dreams, a flight attendant, chowing down on a double cheeseburger in an Anchorage International Airport terminal. "I look at a passenger and I go, 'This guy is telling my love story,''' Hollenbeck told Alaska Dispatch News on Friday. Then the voice said "Brandy Hollenbeck, I've loved you since the moment I met you and I want to be the man for you for the rest of your life. Will you marry me?" Pilot Eric Greener then strolled out of the cockpit and Hollenbeck burst into tears and ran down the aisle. Passengers erupted into applause. Some cried along with Hollenbeck. Hollenbeck was so shocked, "I forgot to say yes," she said. A passenger nudged her to answer, she said. Greener, 34, wasn't actually flying the plane. He had snuck into the cockpit, aided by airline staff who were in on the plan, while Hollenbeck wasn't looking. He waited until the plane reached 34,000 feet before getting on the public address system. 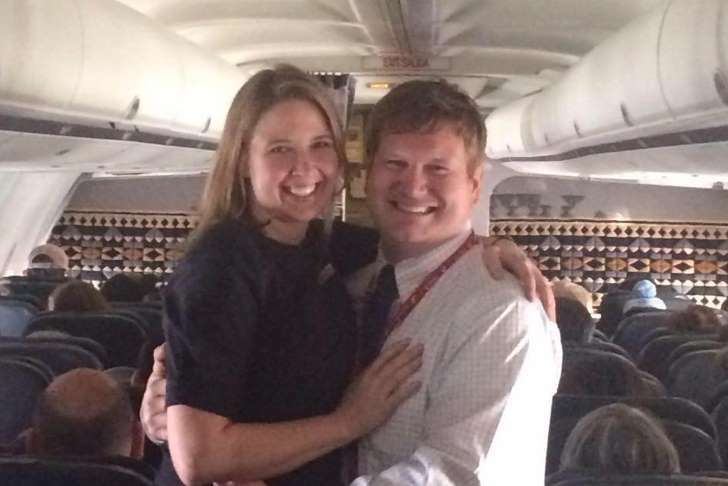 "The pilots were in on it, the gate agents were in on it, everyone was coordinating this proposal. I had no idea," Hollenbeck said.